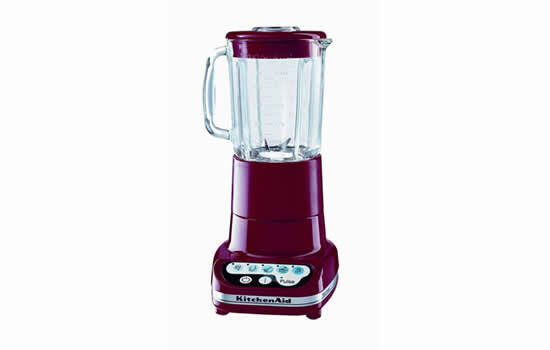 KitchenAid manufactures a series of high-performance blenders that are built to make everything from salad dressings and sauces to smoothies and soups. The Diamond Blender is built with a unique blending system that makes it easier to chop, puree, mix, chop, and stir the raw fruits and vegetables. Plus, an ice crushing and pulse action mode is present. The 60 Oz pitcher comes in BPA-Free plastic to make it healthy and easy to clean. The powerful motor gives the desired vortex to ensure the ingredients get the proper blending results. This blender stands at 8.5 inches x 16.5 inches x 9 inches. And it comes in a die cast base material to offer an attractive finish to sit on the kitchen countertop. The Custom Metallic series of KitchenAid blenders comes in a choice of two striking colors to offer a highly attractive kitchen appliance. It has a powerful motor (0.9 HP) with pulse action, 5 speeds, and crush feature to ensure it is able to take on most blending responsibilities. The 56 Oz pitcher is built to be shatter resistant and accept a family sized portion of freshly purified fruits or vegetables. Plus, the lid comes with a built-in ingredient cup that simplifies the process of adding in more flavors as and when required. The Metallic blender stands at 9 inches x 15.2 inches x 7.3 inches and weighs about 12 pounds. The Artisan series of KitchenAid blenders come with 5 speeds plus the ability to crush ice and pulse mode. The reliable 0.9 HP motor is built to provide a consistent and superb performance to ensure all blending tasks are complete to full satisfaction. The jar size is 56 Oz and this should be more than enough to hold a family sized portion of smoothie for breakfast or midday snacks. The Artisan blender has a compact footprint and measures 9 inches x 15.2 inches x 7.3 inches and weighs about 12 pounds. Also, the die cast metal base makes this appliance very sturdy in use. This 5-speed blender is built to provide a versatile performance with the ability to liquefy, puree, mix, chop, and stir. The 5 speed performance offers a highly versatile machine that is suited to making ultra smooth purees to blending frozen drinks and smoothies. A 56 Oz pitcher is made of shatter-resistant plastic which is easy to clean and maintain. The powerhouse of this blender is a 0.9 HP motor that has the capacity to take on most of the at-home blending tasks. This KitchenAid Blender is built with a die cast base in a choice of three colors: Empire Red, Espresso, or Onyx Black. Plus, a solid base means the blender operates quietly and with more stability. The footprint for this blender is 9 inches x 17 ¼ inches x 8 inches and weighs about 14 pounds.